Women Rock! Bad Girls Do What They Want, Not What They're Told! Good Girls Gone Bad for the Culture! Behind Every Successful Man is a Woman! Who Run the World? Girls! 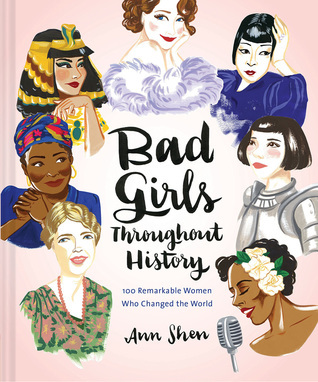 All of these clichés are fitting to the nonfiction book, Bad Girls Throughout History: 100 Remarkable Women Who Changed the World. Just read the first lines! Exactly 100 women are highlighted and illustrated. Not just any women but bad girls—in the best sense of the word. They challenged the status quo, influenced law and became leaders of society. They did amazing things despite personal flaws. Spanning through places all over the world and chronicled by eras, this book makes it easier to see progress and change. The best part is the author's watercolor portraits (as shown on the cover) that accompany each woman's essay. Admittedly, I did not know half of the women listed in the book. I know, I know. 🤦🏽‍♀️ What a shame! But to my credit, the academic grade school I attended (Bates Academy for the Gifted and Talented) focused on minority figures of history. We learned about lesser-known yet impactful people of color. While there is a few Black, Asian and Latina women in Bad Girls Throughout History, there could have been more for balance and recognition purposes. Regardless, it is the perfect read for International Women's Month (March 1-31). It is evident that Ann Shen did her research. I appreciate the brief profiles so the focus stayed on the bad girl without getting too wordy. Very inspiring! I hope the author has plans to publish a follow-up featuring fearless women of today, such as the iconic Beyoncé. In her words, "We run this mutha!" I recommend Bad Girls Throughout History for every badass chick!